We are Ross, a long time fan of Doctor Who, and Victoria, a relatively new convert to the show. We bring unique, informed perspectives to our experience and enjoyment of Doctor Who. Each podcast covers a Doctor Who television story and includes a story synopsis, review and discussion of where each fits in the Doctor Who Universe. Future episodes will cover all the media in that Universe, including audio plays, books and comics. Gallifrey's Most Wanted Episode 016 -- "Doctor Who and the Silurians"
We talk British SciFi history, Prof Quatermass and Zen Buddhism. And the second Jon Pertwee story. Not necessarily in that order. A Missing Serial. Which means we find a way to talk for an hour about 13 seconds of film. KIDDING! Thanks to all the nerds of the 1960s who hardwired reel-to-reel recorders to their televisions to capture sound, we have a complete audio track. Telesnaps -- on set photographs -- have been cobbled together with that nerd-sourced material to make an archive of what the creators intended. And thus, we are introduced to young Jamie McCrimmon, soon to join the TARDIS crew. Also featured in this episode -- Vic gets to discuss the Protestant Reformation, Scottish History and Civil Rights movements, all in one podcast. (Life may never be so good again.) So flin' oan a kilt and come alang wi' us oan a journey to The Highlanders. Gallifrey's Most Wanted Episode 014 -- "The Daleks"
Two Who fans, one Old Who, one New Who, discuss the historic announcement that Jodie Whittaker will be the 13th Doctor. We also discuss new showrunner, Chris Chibnall, and his long-term connection to the show as both fan and writer for television. And we address some of the backlash, what disappointed us, and how we chose to respond. The Twelfth Doctor. Is he a "Good Man?" Is he the "Grumpy Cat Doctor?" Is he another Moffat "Plot Device?" Take a "Deep Breath" and join us for our discussion of lifelong Who fan, Peter Capaldi's introduction as the Doctor. Gallifrey's Most Wanted -- Episode 009 "Rose"
Part 2 of our discussion of the things we saw and people we met at ReGeneration Who 3 Con in Baltimore. Highlights include Comics, Simon Fraser, George Mann, a Tribute to the War Doctor, Heather McHale on Kit Pedler, Feminist perspectives on Companions from the crew at Coal Hill Consulting and Alyssa Franke of Whovian Feminism and a wonderful discussion of Ace where that companion's loving community talked with her creator, Andrew Cartmel, about what she meant to them. It was a fantastic Con, one we recommend everyone try for themselves. These comments represent our experiences only and we only saw a fraction of what there is to see, experience and enjoy at ReGeneration Who. And wait till you see who will be at ReGenWho4! Gallifrey's Most Wanted Episode 007 -- "Time and the Rani"
The Doctor is back, facing his old nemesis, the Rani. This time, it's the Puck-ish, Sylvester McCoy as the seventh incarnation of the Doctor and we see the whole, "Pick a Costume" routine, but with great comic flair and timing. This is the beginning of the end of the Old Who years, but some of the best stories and writing are featured in these last couple of seasons. Is "Time and the Rani" one of those greats? Sit back, and listen as we break it down. Gallifrey's Most Wanted Episode 006 "Twin Dilemma"
It's Six and Peri. And some creepy twins, weird looking monsters and the regeneration isn't going well. It's Doctor Who in the 80s! We were there. We survived it. But how well does this episode do over time? How does it age? Two Nerds go to a Con . . . and love what they see and who they meet and the stories they hear. They love it so much, they want to share stories of their adventures there with you. And urge you to join them at ReGenerationWho Con 4 next year in Baltimore. But for now, enjoy their tales of meeting the Doctor, Steven Taylor, Mike Yates, and plenty of writers, artists and fellow Who fans. They even tell the Pasternoster Gang of their recent foray into American politics. 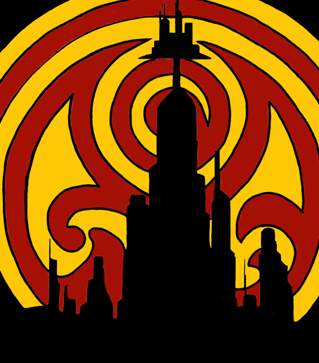 Gallifrey's Most Wanted -- Episode 005 "Castrovalva"
Finally, we see what all the fuss has been about! It's Ross' Doctor, Peter Davison. The new Doctor is young, but his regeneration is rough. He has new companions -- Adric, Nyssa (from Trakken) and Tegan (from Brisbane). It's the beginning of some rough years, lots of costumes instead of clothes, but some genius stories sprinkled in with some crowded control rooms. Listen while Ross explains why this Doctor resonated for him. Gallifrey's Most Wanted -- Episode 004A "The English Way of Death"
Books! We are exploring yet another new medium. This time it is a novel from the Missing Adventures of the Doctor published originally in 1996 by Virgin. The Doctor, Romana, and K-9 arrive in London in 1930 during a heat wave and a time vortex has been hijacked (along with a few bodies of local Englishmen) by an alien menace. It reads like an Agatha Christie novel. The characters are straight out of Noel Coward, and it's a jolly good romp. As usual, we take a few sidetracks that are relevant to us and we talk about next week's Doctor Who Convention, ReGeneration Con! Gallifrey's Most Wanted -- Episode 004 "Robot"
Everyone's favorite Doctor, Tom Baker introduced in his first story, along with everyone's favorite companion, Sarah Jane Smith. It's a UNIT story, so the Brig and Benton are involved as well. We break down this Terrence Dicks story, script edited by the great Robert Holmes. Join us as we launch into the beginning of the phenomenon, when Doctor Who became a worldwide hit. Together in the same room! Ross and Victoria take time away from a family get-together to talk Who, and this time, rate and rank the New Who Companions. Nardole gets a nod and Mickey gets props from Ross and Vic waxes poetic about Rose and River. Another regeneration! Third Doctor, Jon Pertwee, in his first adventure. We meet scientist, Liz Shaw and Brigadier Alexander Gordon Lethbridge-Stewart. Ross gets the synopsis down to about 14 minutes. The discussion is the first recording we ever made -- our test podcast. We liked the feel and pace of that conversation and didn't think we could recreate it. So please forgive the early days audio standards and enjoy Spearhead from Space! Comics! We discuss all incarnations, from weekly two page strips found in "TV Comics" and "Countdown" to multi-page, multi-parters in Doctor Who Weekly and Doctor Who Magazine, to modern comic books from publishers like IDW and Titan. Just 20 mins of background and take on what we love about Doctor Who comics. For the first time since it originally aired in 1966, we were able to watch the Power of the Daleks in its entirety. Ross condensed all 6 episodes into a 16 minute synopsis, so the rest is discussion about the first ever regeneration, the Second Doctor, Patrick Troughton, The Daleks as great villains, the story behind the reconstructed episodes and more. Also, check out our Supplemental episodes that we are doing in between Story Episodes. They are fun and highly nerdy. Breaking News, further introductions and talk about our favorite doctors.